High-density cabling in data centers is increasingly tied to the server rack. Because server racks make it easy to manage cabling systems and protect fibers from external mechanical damage. However, this is only possible if server racks are properly installed and used. In this post, some tips and accessories for server rack installations are listed. Before installing the server rack, make sure that the rack will be installed is best for the needs. There are many types of server racks on the market, so make sure to choose the rack based on the equipment will be housed. Choose the rack based on the type and size of the equipment will be housed, which means the rack must have enough space to house the equipment. The types of server racks mainly include the open server rack, enclosed rack and wall mount server rack. The width and depth of the rack are usually measured in standard units. The server rack 42U is the most popular data center rack, which is 19 inches wide and 73.5 inches high. However, wall-mounted racks are much smaller and are generally suitable for home and small office use. Maybe some people always pay ultra-high cost when buying racks. In fact, most people can save money by choosing a good-quality rack that meets all their needs, without having to choose an expensive rack. It is important to choose the right room in the building. The room should be as safe as possible because server racks often contain valuable hardware with essential company data on it. Others can’t be allowed to access and operate the devices installed in the rack. Otherwise it will affect data transmission. Keep the server rack away from people if possible. The server generates a lot of heat and noise, which is very annoying in the surrounding area. In addition, even if a good rack can provide a lot of protection for the equipment within it, when there are people moving around the rack frequently, the equipment in the rack will be at risk of being collided. Cooling becomes an important factor as the density of equipment in the rack increases. Heat concentration leads to increased power consumption and increased equipment failure rates. The server rack itself will help promote proper cooling, but this is only part of it. It is also important to ensure that the rack does not rest against walls that may restrict airflow. Power distribution units (PDU) are often essential when all servers and other computer equipment are placed in a rack. They ensure stable power to the rack. Finding reliable PDU for server rack installation to meet specific power needs is critical. When users house devices in a server rack, they need to connect cables from different devices to routers, switches, servers, or other devices. Labeling these cables at each end will help quickly determine where they are running, which is critical for troubleshooting. In addition to labeling cables, managing them so that they are neat in the rack is essential. This means trimming long cables, and using the cable organizer to bundle them together. Besides, please run cables along the edge of the server rack as much as possible. Organized cables not only meet aesthetic requirements but also more durable. When plan a server rack installation, make sure it meets all of the current needs and future expansion. Spending more money today to get a server rack that will meet the needs for years to come is saving time and money in the long run. Here are some specific rack accessories for reference to promote rack installation. 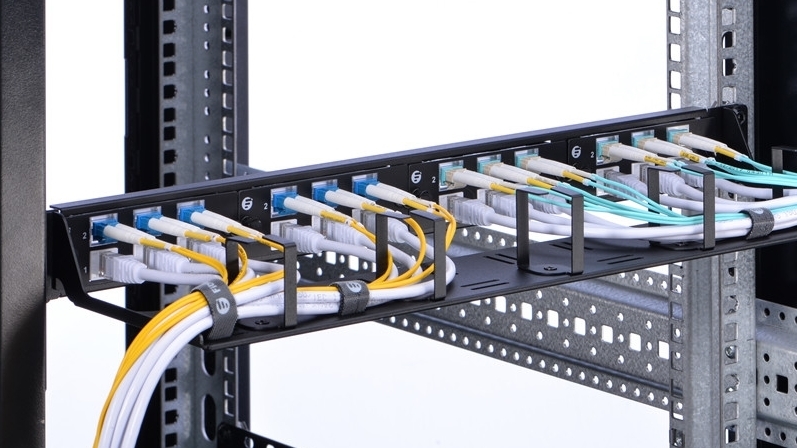 Patch panel can lower the maintenance cost and reduce installation errors. It can provide space-saving and high-density cable connections. Horizontal cable managers allow neat and proper routing of the patch cables from equipment in racks. Vertical cable manager utilizes the additional space to manage the patch cords. Fiber enclosure allows users to make more efficient use of rack space, which offers the superior density, port access, and cable management. Server rack installation is not difficult. Keep the above points in mind, a successful server rack installation can be reached. If you have any questions or needs related to this, please visit www.fs.com. This entry was posted in Cable Management and tagged rack accessories, server rack, server rack installation on September 21, 2018 by Admin.